Let's face it: when someone pulls a flask out of their pocket, most people's first thoughts probably aren't that it's full of cool and refreshingly blessed water. They're first instinct is to check to see if it's 5 o'clock yet so they can grab a drink and join the party. But even teetotalling padres need something sturdy to carry around their holy H2O, since they never know when they'll be called on to bless something, or ward off an evil spirit, or just quench their thirst on a hot day. That's why this Holy Water Flask makes the perfect accessory to any preacher or exorcist costume! 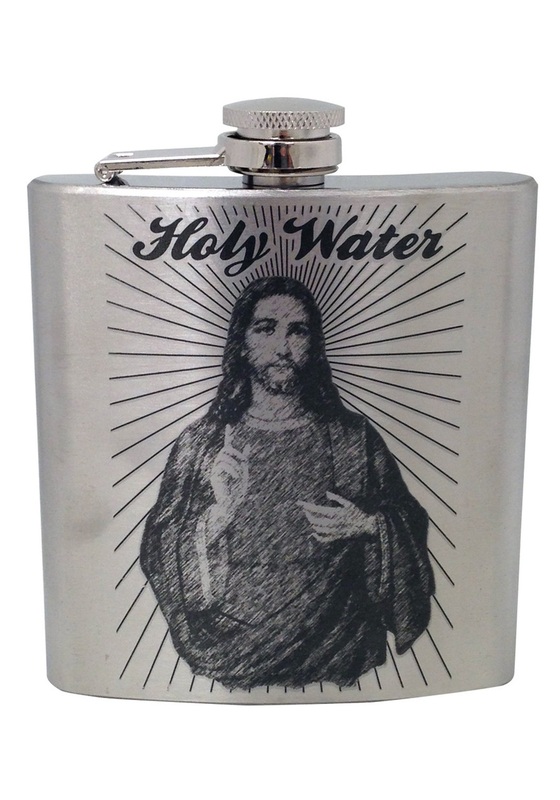 It looks like an average steel hip flask, but with a little extra holy flair decorating one side. We can't guarantee this flask will bless or sanctify its contents (in fact, we're pretty sure it just holds liquid), but the upside of that is you can keep drinks in it that have a little more kick than water!